Two days and counting to Elie’s Tekes Kumpta (“Beret Ceremony”). 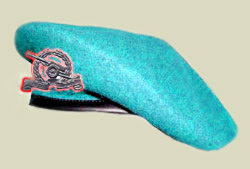 On Wednesday, we will go south to his base to see him receive his blue beret with the insignia of his division. It is a rite of passage – from basic training to the next stage in his army service. The day will actually begin the night before, when the units are taken for a long march through the desert at night, in full uniform, on patrol. In reality, the only real danger they will face is exhaustion, but this too is preparation. The army teaches them to march miles and miles because, in the worst of cases, they may need this ability to get themselves out of danger. Early in the morning, we will leave our home so that we can join Elie in the last 2 kilometers of his walk. It is a gift to the parents, something I want to do. A brief ceremony will mark the actual event and the soldiers will be given their new berets as a sign that they are now officially part of the artillery division. We had the honor of attending a similar ceremony for our “adopted” son, Yaakov last year while he was serving in the Givati division. We showed up, watched the ceremony, and when it was over, prepared to collect Yaakov and leave. Suddenly, we realized that everyone else wasn’t leaving, but were pulling out bags and thermoses and coolers and all around us, families sat and enjoyed time with their sons over an impromptu picnic. Only, it wasn’t impromptu, it was carefully planned – only no one had let us in on this great national secret. The Tekes Kumpta is a family event and isn’t complete without food…and lots of it. So much wiser (thanks, Yaakov! ), we will bring food and dessert with us on Wednesday, knowing that after the ceremony is over, we will sit with Elie and munch and enjoy his company. Soon enough, he will have to go back to his unit, but we have much to look forward to, as Elie will return home on for an extended vacation, his first real break from the army. He will eat what he wants to, sleep when he wants, wear what he wants, do what he wants, go where he wants. In short, for a brief period of time, he will return to being a 20-year-old…rather than a soldier. Too quickly, he will have to return, but his daily life will be different. Once again, the rules will be eased in recognition of his new standing. Basic training is over. They have learned how to shoot these massive weapons, how to handle a gun, and how to blend as a unit. Elie and three others in his unit have learned how to drive the massive vehicle that is part of Israel’s war machine, part of its ongoing need to defend itself. They have learned that discipline is expected and time is a critical element of this discipline. For the next four months, Elie’s training will intensify and then there will be another ceremony to mark the point in his training when he will be part of the regular army. Elie continues his journey to a new phase in his training and a further expanding of his skills, his knowledge, and his abilities. As he ends his basic training, a new group of soldiers is about to be inducted, including Elie’s cousin, who will serve in the air force. It is the way of our country. Each in his time, each in his way. A new group of soldiers and a new group of soldiers’ mothers and a new journey for each. Mazel Tov on Eli’s Tekes Kumpta. It must take a lot of strength having your son defending our Holy Land. P.S. I really enjoy your blog. Visit mine and I’ll link to you if you link to me.